Hey, guys! I hope that you all had a good weekend! We had THE best weather on Saturday and most of Sunday. Since the weather was so awesome, we decided to take advantage of it and went to a local Nature Preserve to get a little walking in on Saturday. 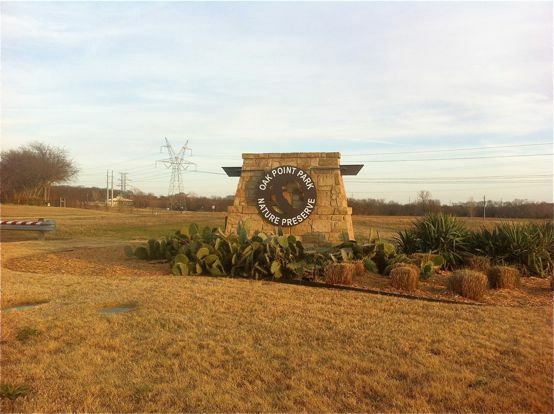 Oak Point Park and Nature Preserve is located in Plano, TX and is the city’s largest park. 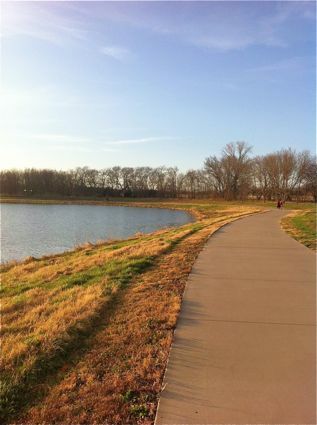 It has over 3.5 miles of paved trails and 5 miles of soft service trails. I ran through part of this park during the Plano Balloon Festival Half Marathon, and I thought it would be a pretty neat place to come back to sometime. Let’s just say, I enjoyed it a lot more this time around. 😉 If you have read or go back and read my race recap, you will understand why. 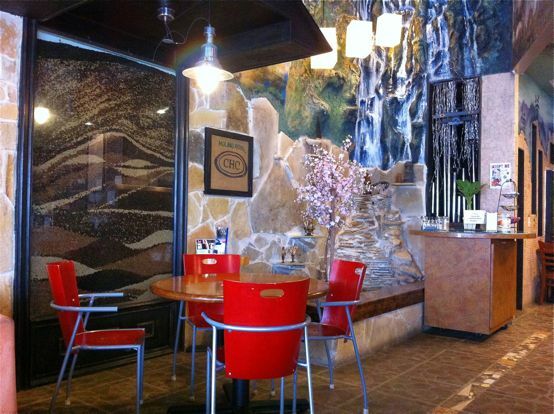 We also visited a new (to us) coffee shop called Caffe Promenade over in Allen on Saturday evening. 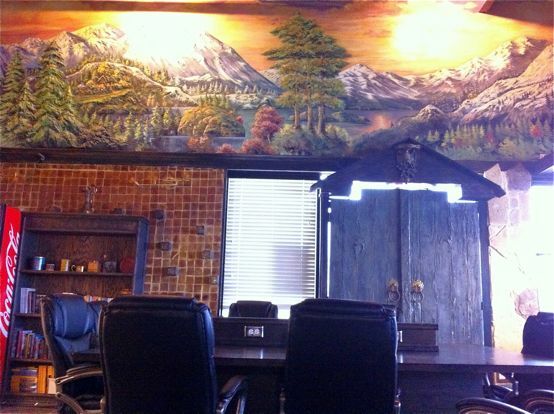 Check out the piece of art on the wall behind the table in the picture below. It’s made out of coffee beans! One of the coolest features of this coffee shop was this huge communal table with office chairs and plenty of outlets. Now, I’ve seen the communal tables at some Starbucks, but I’ve never seen any coffee shop with the comfy office chairs. My husband and I decided we needed to come back and bring our laptops to do a little work/blogging, so that’s what where I am writing this blog post. We’ve only tried their coffee, but they also sell pearl drinks/bubble tea, smoothies as well as donuts. The coffee is good and the employees have been friendly. 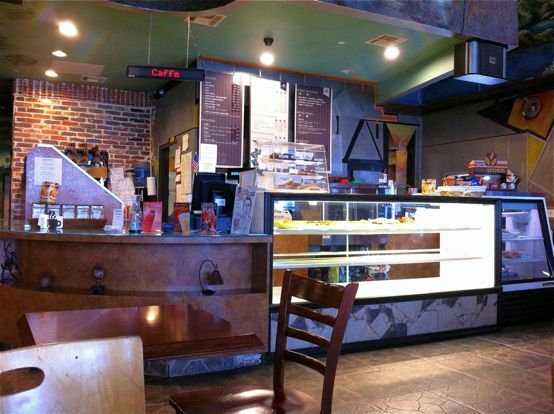 It’s much quieter (at least the two times we were there) than most Starbucks, so it’s great for working and studying. *Quick reminder for those training to run ZOOMA Texas: ZOOMA is hosting a 10 mile training run on March 15th at Lady Bird Lake down in Austin. If you are in the Austin area and would like to attend, you can RSVP here! Tell me something fun that you did this past weekend. Favorite coffee shop? By Tempie at February 24, 2014 . Sounds like a nice place for a walk! We live beside a park that I go to almost daily – this morning I ran there and tonight I walked there with my husband and our dog. That’s a unique coffee shop!